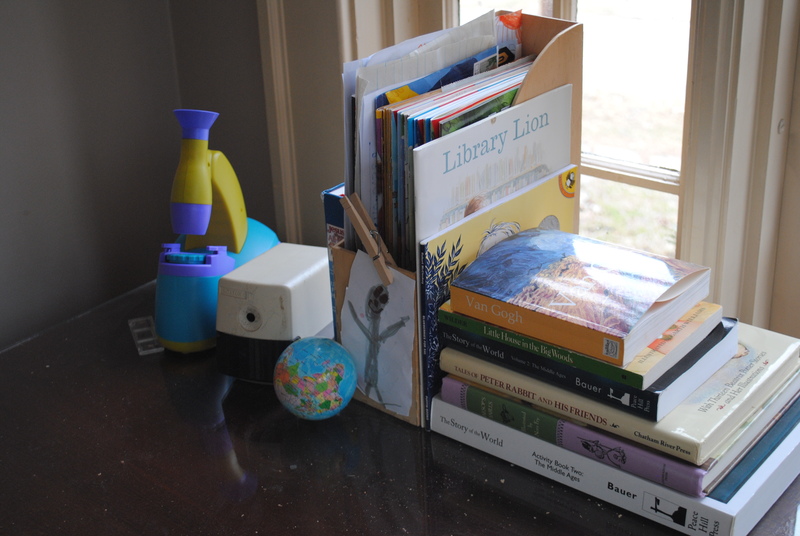 Our days are structured around learning, so it is no surprise that the #1 factor in choosing our new house was (for me anyway) the place where we would “do school.” Now, to be fair, our work happens all over the house, and much of it doesn’t look like school at all. 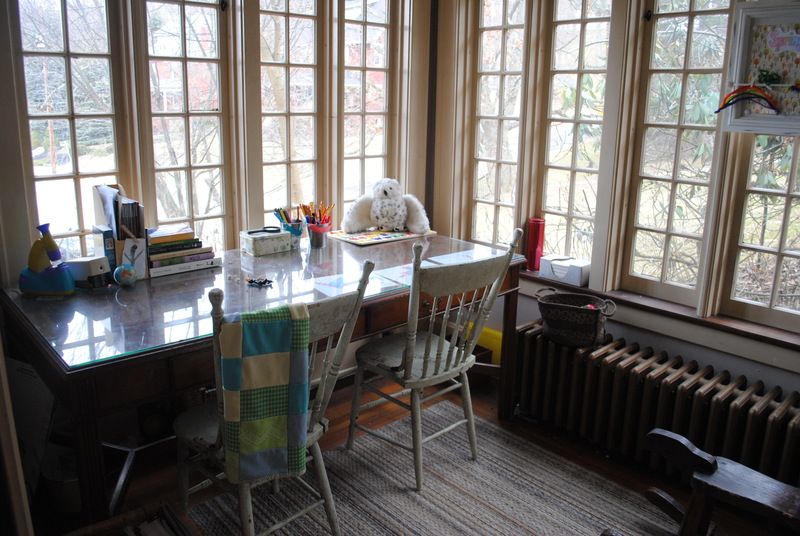 However, when I saw this sunroom, I envisioned cups of tea, good books, finger paintings, and sunshine. 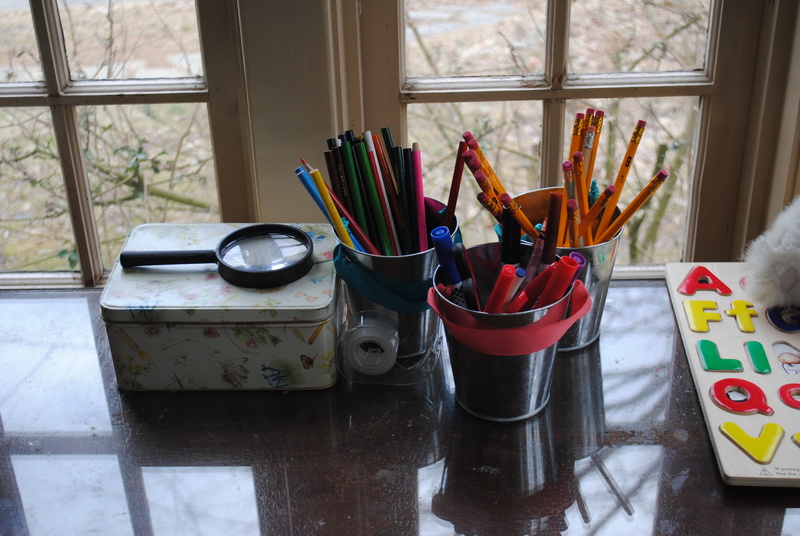 Here is how our “school room” looks when it is all tidied up and ready to go. 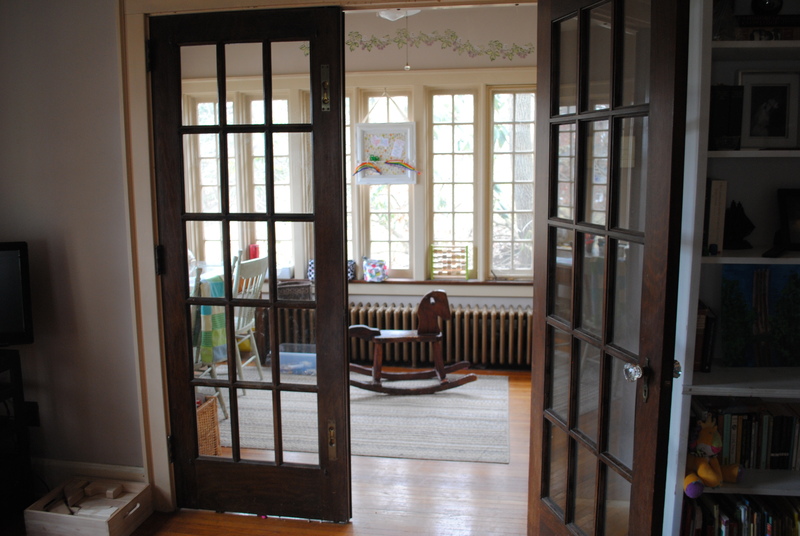 You pass through the French doors to enter the sunroom. The sweet rocking horse was given to us by the house’s previous owner. She said that it was enjoyed by her children and made by her sister. I love having it in our school room. We already owned the loveseat, and it fits perfectly at one end of the room. To give you a sense of the size of our room, it is only a little wider (maybe three feet) than the loveseat itself. The big school table is actually a “retired” library table with two big drawers at the front. I love that it came from an honest-to-goodness library. We adopted it from a friend, and it couldn’t be more perfect for our purposes. Bins beneath the table hold our books and supplies. The wool, braided tote on the radiator holds our percussion instruments. The flowered tin is my sticker box from when I was a child. I still have stickers in it from when I was six or seven years old, plus many new additions. The little metal buckets are from the Target dollar bin. 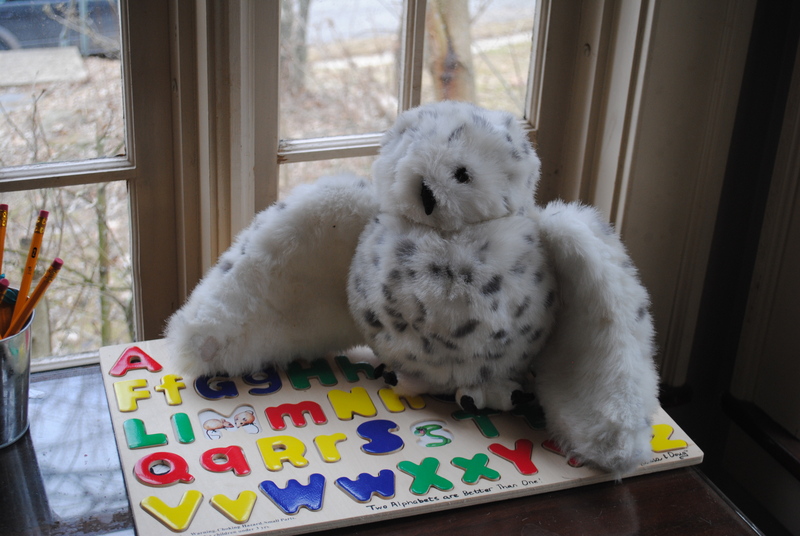 The wonderful owl puppet was a Christmas gift to our oldest son from my parents when he was four. He adored it when he was little, and the owl still brings a bit of charming wisdom to our days. The alphabet puzzle is a Melissa and Doug toy from Aunt Kristy and Uncle Jake. We love to use magazines in our homeschool. We typically use National Geographic Kids and Highlights. The microscope is a “talking microscope” that we really enjoy. It was a gift from my in-laws, and it is used very frequently! The books are ones that we are using currently. We did a unit on the library. We’re slowly reading through the Little House books, and you’ll notice our Story of the World (Volume 2) history book and the accompanying activity book, plus some fables and a collection of Beatrix Potter stories, perfect for spring. This board is the Everyday Display from Creative Memories. Unfortunately, it is no longer available, but I’ve seen them on Ebay for good prices. The board is magnetic. We made the rainbows for a unit on refraction and shamrocks for St. Patrick’s Day. I hope you enjoyed your tour of our sunroom. We love it! Oh what a beautiful room for learning! All those windows!!!! We love the window! The morning light is wonderful. Perfect school room! I love when the sun is shining through those pretty windows!!! Thanks! We think it is pretty great. When we visited your house kn february it was night time. So we didnt get to see the learning room at its fullest glory!!! Wow!! You need to come visit again! We love company! This house formerly belonged to my sister. The sun room was terrific in winter when cardinals flocked to a bird feeder outside the window. There’s rodadendron there. The green leaves, the winter snow and the bright red cardinals who ignored those of us behind the glass made for a lovely spectacle. There are squirrels too and little birds. 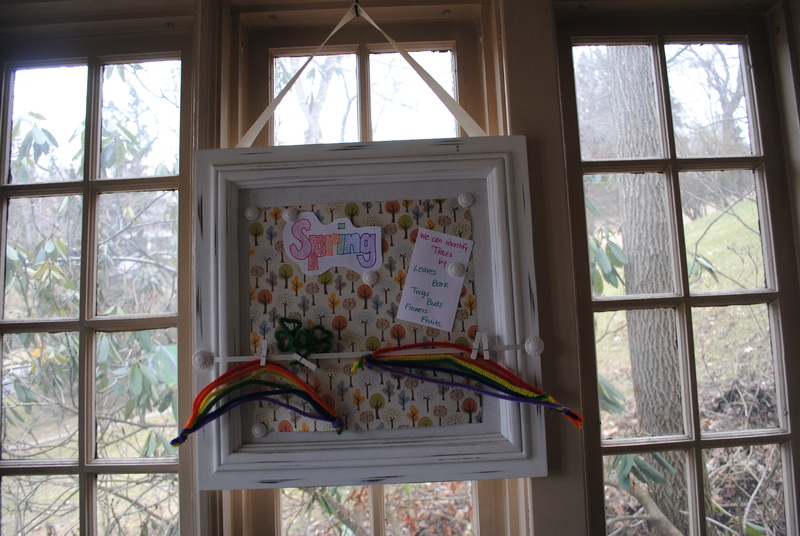 Keep a bird feeder there outside the window and your sunroom will be even more magical. Hello, Barbara! I’m so excited that you found my blog. We are delighted to now own this home. It’s like a little dream cottage for us! We are definitely enjoying the wildlife. We see deer almost every day! P.S. I made the rocking horse. 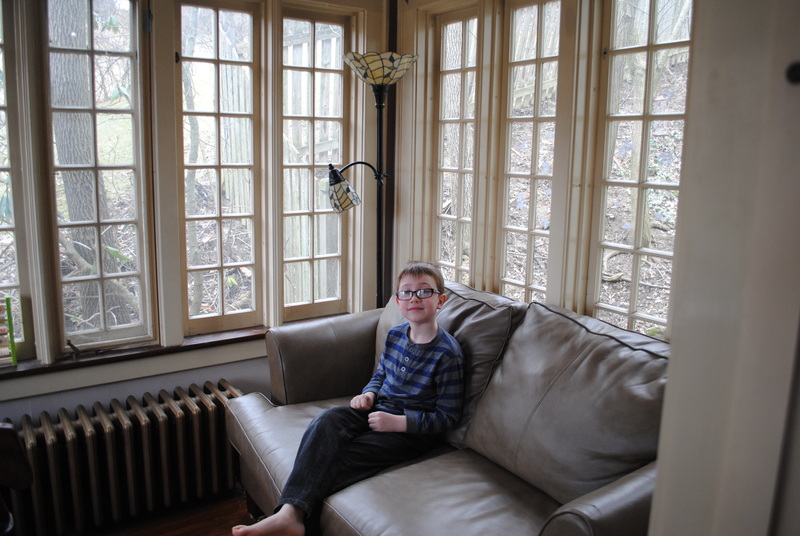 It’s wonderful to see the sunroom again, by the way. When my nephew was 10 months old I gave him the horse. My sister said “He’s not ready for that!” But we put him on the horse and he LOVED it. That was 1982. Emory is 32 now and the horse, I’m sure, is happy to have a new family. The horse adds a little charm to our room. We are happy to have him in the family!